This track plays whenever you're talking to the Trilarians in Master of Orion II, an aquatic race of beings that gain bonuses when settling on planets with "wet" biomes like tundra, swamp or ocean. They are also trans-dimensional beings meaning they can travel between stars before the invention of FTL drives and they get slight movement bonuses too. 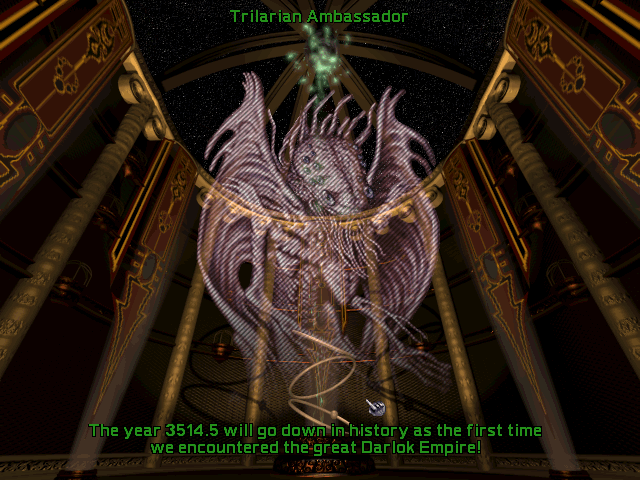 The Trilarians have a dictatorship as their form of government which is the default government in Master of Orion II. I like how this track happens to sound very calm, peaceful and exotic - just what you'd expect for a race of aquatic, trans-dimensional beings.